With the e-mail format you can design an e-mail as you like. The HTML format is set per default and offers several options. You can write HTML and text-only e-mail in your GMX mailbox. Your mailbox is set to the HTML e-mail format by default. 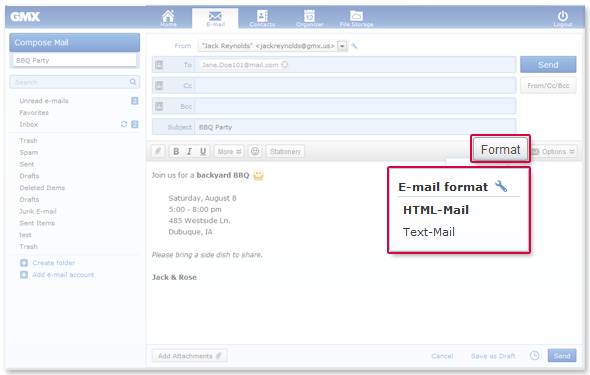 Using the Format button, you can switch from HTML to text-only e-mail for an individual e-mail. If you want to send a text-only e-mail by default, you can change your sending options. If you write an HTML e-mail, numerous design options are available: You can adjust the typeface of the e-mail, paste an image into the body or use stationary templates. You can also check the spelling in your e-mail. 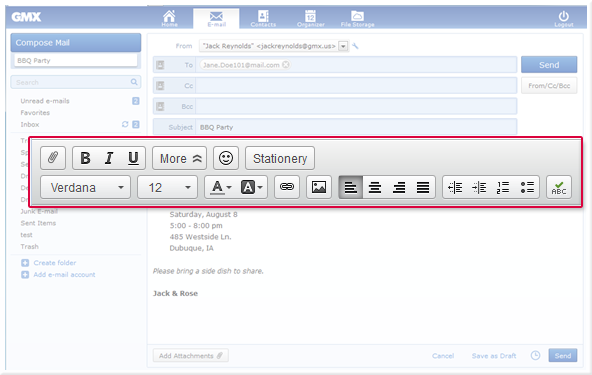 You can find all the design options and the spell check in the bar above the message field. HTML e-mails are substantially larger than text-only e-mails. For example, if you write an e-mail to an e-mail contact who does not have enough storage space in his or her mailbox, you should switch to text-only e-mail. Some of your contacts may have mail software that does not show HTML messages properly. In this case, it also makes sense to send text-only e-mail. If you want to send a link by e-mail, enter the website (for example https://www.gmx.com). When you send the e-mail, the written website automatically turns into a link. However, you cannot click the link while writing the e-mail.